I had the chance to get something to review that will probably be a 'hit' this Holiday Season. PlasmaCar by Plasmart is the coolest ride on toy car. The best thing about it is that it requires no batteries, pedals, gears, or electrical parts to propel the car! You or your child can simply turn the wheel back and forth and it goes! The PlasmaCar innovatively harnesses the natural forces of inertia, centrifugal force, and friction to propel the toy car. The plasma car can go up to 10 mph. It is not recommended to use this on hard wood or laminate. The PlasmaCar can hold up to 220 pounds on a smooth surface or 120 pounds on a rough surface!! Perfect for all around family fun! Okay Okay..Enough talk about it, Let me show you what our Nephew, Andrew thought of it! Y As you can tell, Andrew approves and he loves his PlasmaCar! He completely approves! He absolutely loved it! Overall, we loved the PlasmaCar and we are thrilled that we get to have one. The assembly was simple and the car seems really sturdy. I really love that the weight limit can hold an adult as well. With the Holiday here, this would be the perfect Christmas gift for everyone in the family! 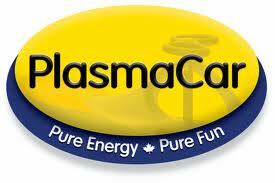 Visit PlasmaCar on Facebook, Twitter and Youtube to stay up with the latest news! You can purchase the PlasmaCar in : yellow, blue, purple, pink and red. It retails for $69.99! Check out where you can buy on their website. We got a Plasmacar for my son this summer and he absolutely LOVED it! They're so much fun! I had been thinking about getting my 2 year old grandson a Plasmacar for his next birthday. I didn't know it would hold an adult's weight as well. Guess that means his Mom & Dad get a birthday gift as well! Thnks So much for the review!! !